DC food lovers strive to be in the know about upcoming restaurants. It’s nearly impossible to keep up. Participants in Sunday’s New Kitchens on the Block event (NKOTB) at Mess Hall benefited from a sneak peek at eleven upcoming restaurants. They include ventures from several well-known veteran chefs, and a few who are making their debut in the spotlight. When writer Nevin Martell and founder of Mess Hall Al Goldberg band together to create an event, its bound to be a hit. This is the third New Kitchens on the Block from the duo. 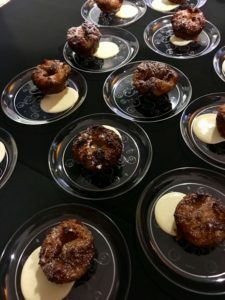 The event provides a unique platform for chefs to inform guests about their new venture, as they present a signature dish and cocktail. Get your forks ready, DC. Here’s what’s coming. A second location of Bindaas, featuring Indian street food, will open in Foggy Bottom in Fall 2017. 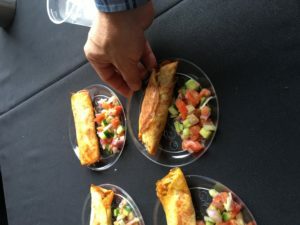 Chef Vikram Sundaram (Rasika) previewed lamb kathi rolls, and showed off the gorgeous new Rasika cookbook. 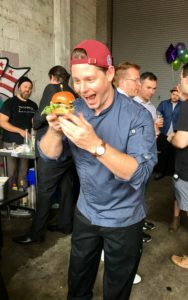 Chef Alex McCoy (Alfie’s, Duke’s Grocery) will open Lucky Buns, inspired by the burger creations of SE Asia, Australia, the UK, and beyond. The team served up a burger with Creekstone Farms beef patty, smoked cheddar, grilled onion, pickles, and arugula on a Lyon Bakery brioche. The chef, who appeared on “Food Network Star,” is known for burgers, and is definitely a ham. The restaurant will open this fall. There’s no location yet for this spot from former Buddhist monk and refugee Dorjee Tsering. Look forward to Tibetan nomad-style dumplings and Himalayan street snacks. 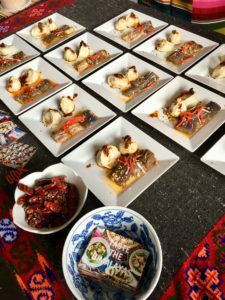 The chef showcased lamb and chicken dumplings with a 21-ingredient spicy sepen dipping sauce, and chilled Sichuan eggplant salad. Opening 2017. The Line Hotel is set to open later this year in Adams Morgan. The hotel will house two spots from Chef Erik Bruner-Yang (Maketto, Paper Horse). Brothers and Sisters will offer American and Asian fusion cuisine. Spoken English will be a tasting menu destination. 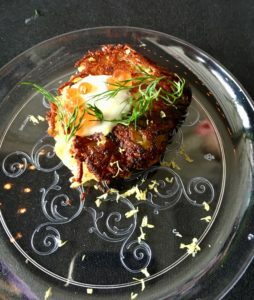 The chef and his team presented potato rosti with crème fraiche and caviar. The Eleanor will be a bowling lounge, bar, and restaurant offering a bar menu featuring regional products as well as an outdoor space for crab boils, pig and lamb roasts, and barbeque. 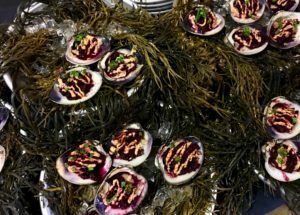 Chef Adam Stein (Red’s Table) prepared clams and chorizo on the half shell, beet kimchee, grilled clam, chorizo aioli, chive cress. The Eleanor will open in 2018. Location TBD. 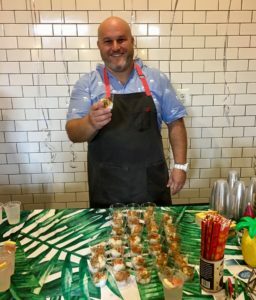 The three-time “Chopped” Champion, Adam Greenberg (Barcelona) will open Coconut Club near Union Market in Spring/Summer 2018. His island-inspired menu will include cured Norwegian salmon poke with shoyu, scallion, crispy onion, and caviar. The Compass Rose team is set to open Maydan this fall at 1346 Florida Avenue, NW. 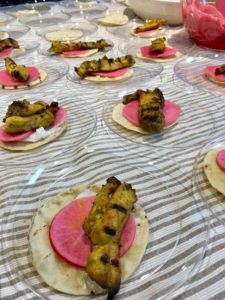 The restaurant’s theme is inspired by “the flavors of forgotten and forbidden lands, ancient east-west trade routes and cooking techniques.” The Maydan team prepared turmeric grilled chicken with pickled turnips, garlic sauce, and flatbread. Their Jnayney (garden) cocktail of gin, fennel, dill, cucumber, water, lemon, and arak mist was a crowd favorite. Pluma will be a bakery/café near Union Market from the team behind Bluebird Bakery, which provides wholesale pastries to DC restaurants and cafes. Camila Arango and Tom Wellings introduced their Kouign Amann to the appreciative crowds. The pastry is an addictive blend of dough, caramelized sugar, homemade apple butter and crème anglaise. Pluma is slated to open in 2017 at 391 Morse Street NE. The duo behind local charcuterie company Cured DC plans to open a charcuterie beer garden next year. 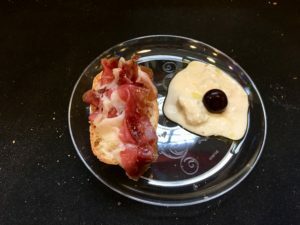 They served a duck prosciutto sandwich with orange butter and stracciatella with pickled berries. One of the restaurants opening in The Yards comes from Chef Haidar Karoum (Proof). The restaurant will highlight the chef’s Lebanese background, as well as his extensive travel in Western Europe and Southeast Asia. 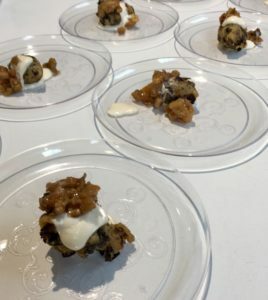 The chef’s NKOTB signature dish was a mushroom and leek zeppole accented with whipped yoghurt and eggplant agrodolce. Chloe will be located in Arris, a newly completed building at 1331 4th St. SE in The Yards neighborhood. It’s scheduled to open later this year.